Formerly known as the Grand Hotel Florence, the hotel went into renovation 10 months ago to bring back its historical grandeur and artisitic heritage. The building itself was designed in 1432 by the architect of the Duomo Santa Maria del Fiore. It was originally the home of a noble family. The hotel's romantic location on the Piazza Ognissanti, overlooking the Arno river, offers one of the most enchanting views of the city over the churches, the hills and the belltowers of the Florence's Oltrarno with Ponte Vecchio as background. The St. Regis Florence features 81 spacious guest rooms and 19 suites, including a spectacular designer suite by Bottega Veneta. All the hotel's guest rooms and suites feature individually hand carved gold leaf plaques including one of three different color palettes-Medici, Florentine and Renaissance. 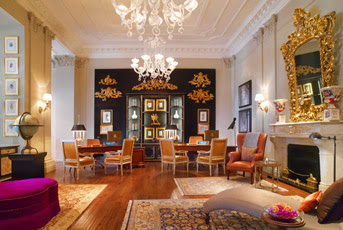 Each design concept offers a unique selection of custom designed furniture, paintings, frescos and crystal chandeliers. 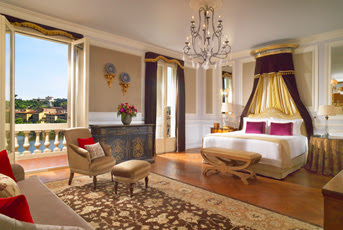 Every guest room and suite is named after noted Italian artists, benefactors and nobility. Looks beautiful! I was in Italy in September.. Didnt go to Florence though :( i must plan another trip!